It’s almost a year now since the Sherminator came to live with me. He has many nicknames, this spotted dog, and the latest one is Hairy Squatter: we’ve been reviewing all the Rowling movie adaptations so we’re ready to see the final battle for Hogwarts and the universe on the big screen some time this week. Here’s a photo of Sherman the day after I brought him home. Sometimes I miss this little goober. He weighed about 20% of his current heft, and he didn’t have a clue about anything but snuggles and snacks. And farts. His gastrointestinal symphony was just as fragrant: he’s just added more tuba in adulthood. He was a lap dog back then. Somedays, I really miss that warm puppy smell. You know; the one that smells like a mix of sweaty feet, overcooked meatloaf, and nacho cheese Doritos. Folks would never buy fabric softener in puppy scent, but everybody likes the smell on a pooch, probably because it comes with floppy loose puppy skin and satiny soft ears. Oh boy, here I go. Cat got me going yesterday over at this sweet little darling on Cat, Chaps and Emma. 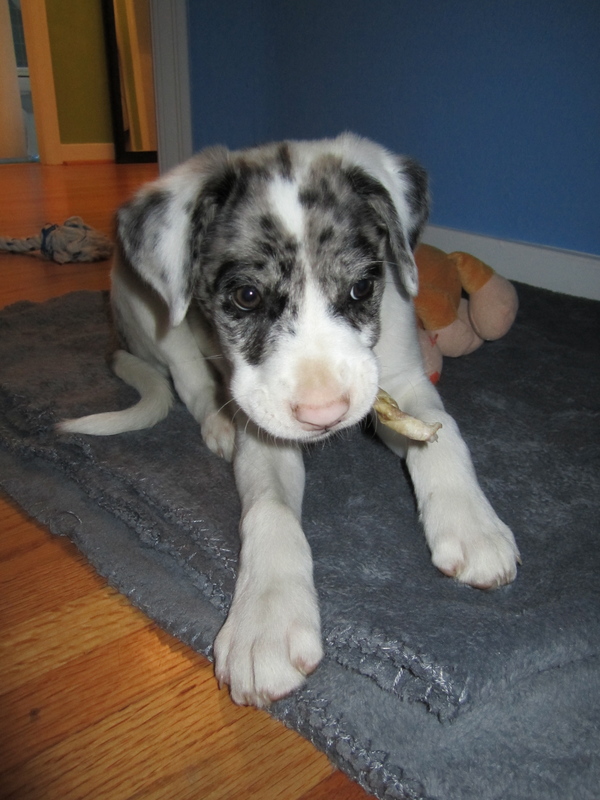 I have puppies on the brain, and I’ve been day dreaming about bringing home a friend for Sherman. Immediately as I typed that (seriously, no joke) Sherm walked by, tilted his head, and whistled at me. From under his tail. I think one is enough, and I think I’ll go open another window. I love ‘Hairy Squatter’ haha. Sherman is a cutie and so clever to let you know to stop thinking about bringing home another dog. I’ve always had single dogs, my husband has usually had multiples – Advantages to both for sure. Our pets are our best companions, loved, enjoyed and appreciated. Right you are. I’ve never had a human friend as trustworthy, loyal, and forgiving as the dogs I’ve been lucky enough to love.